Celebrating the 40th Anniversary of the acclaimed musical, the Secret Theatre's production of A Chorus Line reminds us why we love this musical. Between the music from Marvin Hamlisch and Edward Kleban, the book by James Kirkwood and Nicholas Dante and the captivating dancing originally choreographed by Michael Bennett, A Chorus Line will forever be a classic, entertaining musical. But it also reminds us how desperately it wants to be modernized. Directed by Tom Rowan, the scribe of “A Chorus Line FAQ”, this revival is a celebration of the original musical. 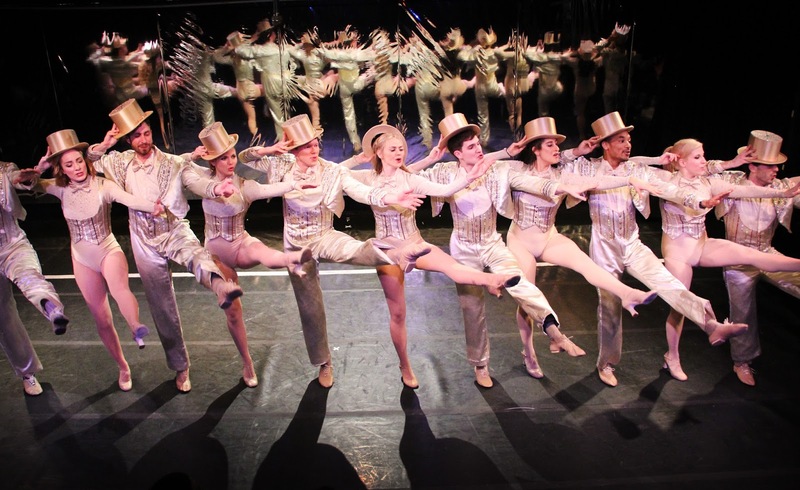 A Chorus Line is the story of the ultimate theatrical job interview. A group of young, eager dancers seek an opportunity to dance on the line in a new musical. They just have to face an audition like no other. Complete with iconic dance routines and one singular sensational score, A Chorus Line is a piece of theatrical history. No matter where you see this show, shades of the 1975 production will be incorporated. And no matter who's at the helm, it proves that the show is formulaic. The costumes are throwbacks to the original, though costume designer Heather Carey takes some liberties like placing Mark in a baseball tee reminiscent of Zac Efron in " High School Musical." If you know the original show, you can easily pick out the characters simply by their dance attire. And you have to wonder how much fun that actually is. When it comes to the choreography, the Secret Theatre's production is led by Geena Quintos, who also portrays Diana Morales. While the text prescribes certain steps, Quintos sticks to the stuff we know. With all the beats nearly spelled out already and all mystery gone, I suppose the reason to experience A Chorus Line is for the talent on stage. And this production certainly was filled with it. Though Cassie and Zack may be the central players, this production highlighted the featured players of the ensemble. Madeline Fansler is feisty as Sheila. Fansler has a bitter bite that furthers Sheila's jaded persona. Markus McLain is simply endearing as Mark. As the resident youngster on the line, McLain's Mark is filled with life and hope. A late addition to the role, Kelly Barberito is stunning as Maggie. Barberito has a purely divine vocal, capturing hearts in "At the Ballet." As Bobby, Caleb Schaaf serves up the funny. When it comes to the other couple in the story, Adrian Grace Bumpas as Kristine carries the duo, outshining Kevin Lagasse's Al. Bumpas is a natural. In the end, it's a bit shocking that Barberito's Maggie and Bumpas's Kristine don't make the cut. Especially over some of those who do. As Diana, Geena Quintos has a fine voice with two of the best numbers in the score but it seemed to be lacking the passion. In the ensemble numbers, Jennifer Knox’s Cassie can't seem to hit the heights of the score but easily redeems herself by the time we reach "The Music and the Mirror." There's something interesting about Matthew LaBanca as Zach. To play with the original concept, LaBanca is relegated to an unseen voice. The struggle is it's hard to tell if it's live or simply a series of sound cues. The way LaBanca reacts to his fellow actors doesn't quite seem accurate. It feels like monotonous canned reactions. If it is a live microphone, the problem may be the physical inability to connect. And it's a shame because when he is seen, LaBanca is a strong leader. Nevertheless, the entire ensemble does exactly what they need to do. And that's dance. And somehow they don't seem to break a sweat until they finally do gas out in the finale. And rightly so. From a production standpoint, A Chorus Line encountered some major obstacles. The first being that tiny stage. Fitting this dance heavy show on the stage of the Secret Theatre seemed near impossible. But they managed, though some dancers were sacrificed. Due to the lay of the land, an intermission was built in. And nothing kills momentum like an intermission, though the company was likely grateful. With the show being set in a theater, there was little to be done to transfer the space. The essential scenic element is the iconic mirror. Instead of a mirror wall, scenic designer John Lavigne gave us a mylar mirror wall which is all well and good had the seams been fixed and the track used to strategically hide it not been as loud and distracting. Speaking of distractions, the buzz and feedback from the sound system during Zack's dialogue remained present in certain key moments. Thankfully it was missing during Paul's monologue of vulnerability. 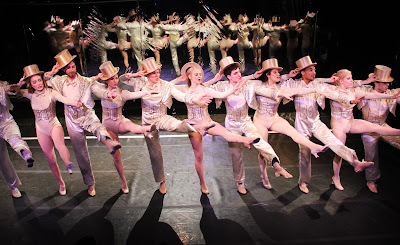 The Secret Theatre presented a solid production of A Chorus Line filled with many unavoidable restrictions. I can only imagine what could have been explored with freedom. Perhaps one day when permission is granted, A Chorus Line will be given a breath of new life by being transported to the 21st Century. It may be a period piece in the eyes of some, but the stories the dancers share are still prevalent. And that's why A Chorus Line will always be relevant, regardless of time.